The Bosch Hammer Drill is a perfect tool for small diameter drilling applications. The drill, with its accompanied accessories package is big punch in a compact package. The hammer drill is a lightweight tool weighing only 4.2 pound which is quite comfortable for handling and is also easy on hands and arms. The drill has a powerful 7 amp motor that has power to spare while handling regular jobs. This hammer drill offers an outstanding drilling capacity, which is up to 5/8 in concrete, up to 1-1/2 in wood and up to ½ in steel. The tool can also be used with small whole saws. The Drill has an operating range of 0-3,000 RPM and 0-48,000 BPM, which is ideal for a wider variety of work which include electrical tile, metal construction , HVAC and various wood carpentry applications. This drill is a very versatile product in its category. It can be easily converted from rotation mode to hammer drill mode with a turn of a switch. A well configured variable speed trigger allows users to adapt to different working surfaces without any difficulty. The variable speed trigger enables accurate bit starting and it is also helpful while removing bound bits and fasteners. The 3600 auxiliary handle comes with a built-in-quick-release depth gauge which enables users to easily and quickly adapt to different situations while working on different surfaces. The Drill comes with a sturdy case and a rugged ½-inch, 3-jaw chuck. The patented rotating brush plate in the hammer drill renders equal power in reverse mode to back out the bound up bits and thus increases brush life significantly. The hammer drill has two speed modes fro wood and steel. The Bosch Hammer Drill comes with a one year warranty. 	Cord - 8 ft., 2-Cond. 	The Bosch Hammer Drill is rated for drilling 5/8 of concrete, while its contemporaries in the category are rated just for 1/2" or 4/8. 	The drill doesnt heat up even after prolonged use. Users have noticed that the drill doesnt heat up even after using it for 8-10 hours in hammer mode. 	Also the hammer bits dont get burned up after a few uses. 	The grip on hammer drill is not comfortable for people with large hands. The handle should have been more ergonomic which would be suitable for different hand sizes. 	The auxiliary handle in the drill should have been a metallic one. Bottom line: Considering the aggressive impact mechanism of the Bosch Hammer Drill, it is one of the best power-to-weight performers in its class. The soft grip handle and integral slip clutch minimizes the torque reaction while handling the tool on different surfaces. The hammer drill has a metal house casing which gives its ruggedness and increases its life. 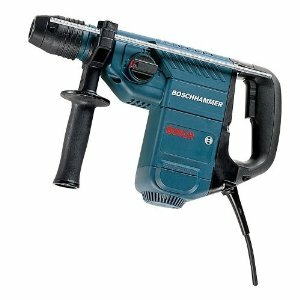 Return From Bosch Hammer Drill Page to Home - Finishcarpentryhelp.com.